The global electronics industry is showing an upward trend and has opened thousands of avenues for original equipment manufacturers, suppliers, marketers and sellers who are operating in this segment. 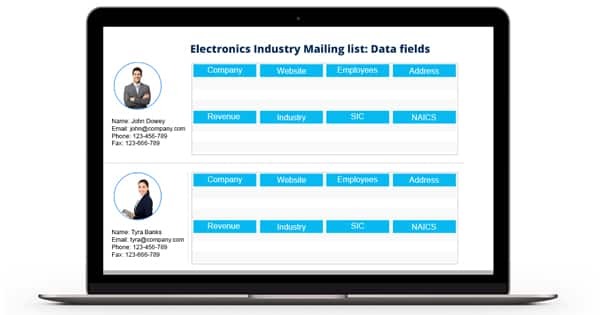 If you are a marketer looking for qualitative marketing database to connect with stakeholders and decision makers in the electronics industry, Blue Mail Media’s Electronics Industry Email Database can solve the purpose. Our Electronics Industry Email List covers extensive information to help you carry out your multi-channel marketing campaigns with ease. We provide comprehensive data that helps you connect with your target market via telephone, email or mail. The electronics industry is surely one of the highly rewarding industries where the only thing that can hamper your growth is lack of qualitative database and a poor business strategy. While you take care of the latter, we will provide you with highly reliable and competent database that will help you achieve enhanced interactions, conversion rate and returns on investment. Blue Mail Media team follows a stringent process of data collection, verification and update to ensure our Electronics Email Database is updated at all times. Over the years, Blue Mail Media has been able to build a strong network of data vendors across the U.S., U.K, Canada, Europe, Africa, Russia, China, North America, Switzerland, Australia, New Zealand, India and more. This global network helps us to collect and deliver data in multiple regions. We give our clients enough flexibility to choose from our pre-packaged Mailing List of Electronics Industry Executives or opt for a customized database depending upon their campaign specific requirements.